Certain organizations and non-governmental organizations (NGOs) are waging a relentless campaign to tarnish the name of Sri Lanka globally. That is why at least three organizations have again carried pictures of so called atrocities by the Sri Lanka Army, said Mass Media and Information Minister Keheliya Rambukwella this morning (Oct. 21). Sri Lanka has clearly proved the lies behind these campaigns through several experts in the fields. But they still persist, added Minister Rambukwella, adding that the government is fully prepared to face this fresh round as well. When the media asked Keheliya Rambukwella about the United Nations wanting a report from Sri Lanka on the final stages of the war, the Media Minister said the government is to hand over a report once the Lessons Learnt & Reconciliation Commission (LL&RC) finalises its findings. “This will be the only official report by the government. Apart from that there may be certain unauthorized reports and ‘kelapattaras’ from certain quarters,” Minister Rambukwella added in lighter vein. 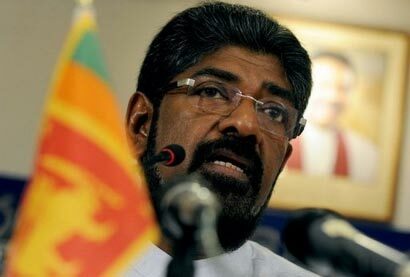 During the media briefing at the Government Information Department in Colombo, Minister Keheliya Rambukwella said that though most knew the answers to the question of the increase in the defence budget, they still spread a negative picture saying that though the war had ended the government was still increasing the defence budget with ulterior motives. Drawing an example, Mr. Rambukwella said when the military needed multi-barrels in their final thrust into the north; these were provided by certain countries due to Sri Lanka’s friendship with them. “They were ordered over the phone and we received them. But we have to pay for them now. That is why the defence budget is still high,” he reminded. Sri Lanka is still under threat from a re-vitalised rump LTTE who are conspiring with Norway and imperial West for a new militant insurrection. JVP, smarting under the rout they suffered in the general election, has fallen back on their old game of stirring-up university students and other disgruntled youth in the country as tools to create anarchy in the country, to capture power by the backdoor. Hence SL is not completely out of the woods yet. There are enemies of peace and unity in SL. They have to be utterly defeated. SL has to be constantly on its guard against such enemies and saboteurs. Hence the need for defence expense, to pay for armaments already procured, as well as to meet the costs of even a better-equipped and stronger army in men and materials to protect the country from its enemies. Saudi Arabia has no enemies as we have. Yet it is purchasing $82 billion worth of defence aircraft alone, from USA this year. Its Defence Budget runs into US dollars billions many times over, to fight Israel? You are a real laundryman of President Rajapaksha. Did President Rajapaksha send you for a special laundry training? If it is so, please keep that training certificate for your future needs. From now on keep one white cloth for your “PANSUKULA CERYMONY”. Don’t you feel shy for all these hanky panky business. It is better to commit suicide than living with this kind of mentality or better live in naked.